I love music and listen to a wide variety of styles and types. But when it comes to performing, my specialty is the classic jazz of the 1920s and ’30s that originated in New Orleans. 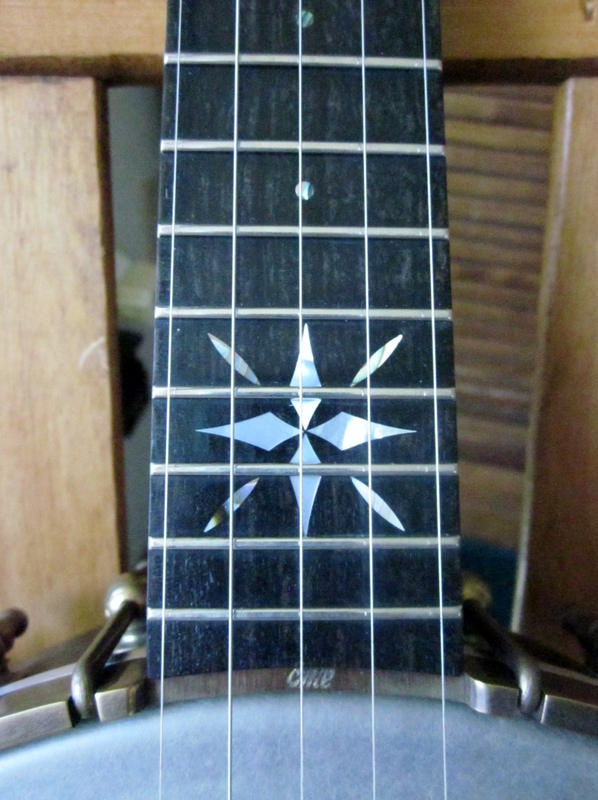 For that, I play four-string, plectrum banjo and a 1928 National resonator guitar. I play professionally, performing solo, in a duo called Jazzstrings with my husband on string bass, and in several small combos and bands, including Combo de Luxe, and The Rain City Blue Blowers and Uptown Swing and Jazz. I am also called to sub in other groups. I’ve performed in many different venues and situations, including weddings, memorial services, parties, park concerts, community festivals, corporate events, and on a jazz cruise. I also play the 5-string banjo in old time, bluegrass, and Celtic music. I’m a loyal attendee of the American Banjo Camp, and have written articles for Banjo NewsLetter magazine. There is a new band in town, so to speak, and it certainly has a different sound among traditional jazz bands. It is the Combo deLuxe, part of which is from Tacoma, guitarist Candace Brown and bassist Dave Brown, and part of which hails from the Portland, Ore., area, cornetist Chris Tyle from Milwaukie, Ore., and reed man Jim Buchmann from Vancouver, Wash. The band has a sound reminiscent of the Muggsy Spanier-Sidney Bechet Big Four, which was a recording group from 1940. Tyle, who also plays clarinet and sings on the band’s new compact disc, is the leader of the Silver Leaf Jazz Band and has performed with many bands in the Portland area and New Orleans. Buchmann, known commonly as “Gentleman Jim,” who also plays alto and soprano saxophones on the CD, has played with Climax, the Black Dogs, Walt Disney World’s Epcot Center, among others. Dave Brown also plays with the Louisiana Joymakers! and played banjo and guitar with several~ bands, including Uptown Lowdown and Stumptown. Candace Brown is part of Jazzstrings, the Browns’ band. She also manages the band. 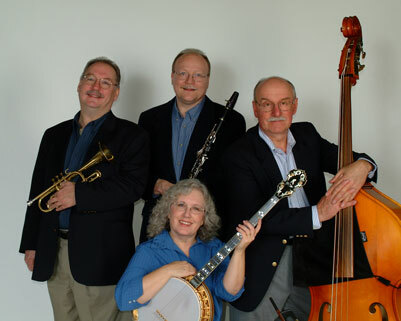 Combo de Luxe is a quartet consisting of cornet, clarinet/soprano sax, guitar/banjo, and string bass, featuring, respectively, Chris Tyle, “Gentleman Jim” Buchmann, Candace Brown, and Dave Brown. This isn’t your usual chamber jazz instrumentation by any means, but on the other hand, it isn’t quite unique in the history of jazz. You may recall the Bechet-Spanier Big Four with Sidney, Muggsy, Carmen Mastren and Wellman Braud. They recorded some noteworthy sides with the same unorthodox line-up back in 1940. To mention this precedent is not to imply that Combo de Luxe is attempting to recreate or emulate the Big Four, however, because they are not. They have their own sound, style, and repertoire. Steve Wright is reedman for the group here, but Jim Buchmann fills that role on “Some Sunny Day.” Chris Tyle (cornet, clarinet, and vocals) is well-known in the jazz world as a multi-instrumentalist, bandleader, scholar/historian, and instructor at jazz camps. He began his career in Portland, Ore., where his father, Axel Tyle, was a member of the Castle Jazz Band, a trad outfit contemporaneous with San Francisco’s Yerba Buena Jazz Band. Young Chris got his start in Portland with Don Kinch’s band, The Conductors, in the late 1970s. Later, he moved to New Orleans, where for a number of years he led his Silver Leaf Jazz Band. He has been recorded extensively (50 sessions at a recent count). After returning to the Pacific Northwest, he has been busy on the festival/jazz party circuit, recording, instructing, and leading Combo de Luxe. The reed man, “Gentleman Jim” Buchmann, also has an illustrious resume’, having worked as a member the Climax Jazz Band, the Black Dogs, and several other bands. He has been a guest star at festivals and, like Tyle, an instructor at jazz camps. Some Sunny Day is his 39th recording. The rhythm section consists of Dave Brown and his wife, Candace. Based in the Seattle area, they work as a duo called Jazzstrings, with Dave on string bass and Candace on banjo and guitar. Each one has also worked independently in various festivals and on cruises. Combo de Luxe offers us an eclectic spread, including several gems from the Great American Songbook and a few classic jazz and blues items. The program is admirable. Here are some highlights: “Some Sunny Day’ is a delightful Irving Berlin song, and it is surprising that so few musicians are familiar with it. Tyle takes a vocal on this one, as he does on three other numbers. Dave Brown vocalizes on Jimmy McHugh’s “I’ve Got My Fingers Crossed,” which appeared in the 1936 movie musical, King of Burlesque. “My Heart” is, of course, the tune Lil Hardin Armstrong wrote for the Hot Five. “My Monday Date,” the Earl Hines tune recorded by Jimmy Noone’s Apex Club Orchestra, features a two-clarinet frolic by Tyle and Buchmann. “Georgia Cabin” is a melodically appealing number composed and recorded by Sidney Bechet in 1941. In short, this CD displays tasteful playing with a high order of musicianship. The music swings and provides easy, rewarding listening.